This is to notify that, All 3rd and 5th Semester students are instructed to appear the sessional on 24th and 25th of October, 2014. Students are instructed to contact their respective HOD to appear the said sessional as per SCTE & VT guidelines. Any clarifications further contact to the examination I/C. This is to notify to all students & staffs, due to “HUD HUD” Super Cyclonic effect, college will remain be suspended w.e.f. 11/10/2014 to 13/10/2014. However College will remain be as usual on 14th Oct, 2014 onwards. It is notified to all the students of 1st Semester their 1st Internal examination will start from 21st Oct to 22nd Oct, 2014. The details of Examination program is attached in separate sheet. The 3rd and 5th Semester 2nd Internal Examination will start from 21st Oct. to 22nd Oct, 2014. The details of Examination program is attached in separate sheet. This has been instructed to all the students to appear the exam with full attendance otherwise their internal examination mark to be absent and same will be sent to SCTE & VT, Odisha. Students are advice not to use mobile & make a fare examination conduct. 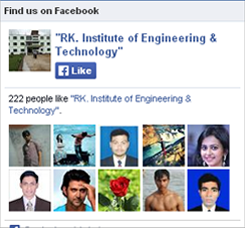 It is noticed to all the Staff (Both Teaching & Non-Teaching) & as well as the students of R.K. Institute of Engg. & Technology that the college will remain closed on Monday dt.14.04.2014 on the occasion of “Mahavishuba Sankranti”. This is to notify that, on account of “Sriram Navami” 8th April, 2014 will be declared as a National Holiday. However all classes will be suspended. It is hereby noticed to all teaching and non teaching staff that they should present and maintain the discipline at the time of procession of Lord Biswakarma of our Institution. They also co-ordinate the students to success our procession in a disciplined manner. This is to notified to all students & Staffs on the eve of Deepawali College will remain close on dated 23.10.2014 (Thursday). Wish you all a very happy, prosperous and safe Deepawali. This is hereby informing to all the students from 24th of Oct. 2014 onwards students without I-Card, College uniform will not be allowed inside the campus. Those students who are availing bike will be strictly banned in the college campus. Students should co-operate otherwise disciplinary action will be taken up with priority basis. This is to notified that all the Student & Staff of R.K. Institute of Engg. & Tech. on behalf of Durga Puja College will remain closed ensuing w.e.f. 1st Oct., 2014 (Wednesday) to 8th Oct., 2014 (Wednesday). All essential work will be carried out on regular basis during vacation. The details of the staffs meant for roaster duty is attached herewith. Wish you all a happy, prosperous & delightful “Durga Puja”. May God bless to all R.K.I.E.T Family on the eve of “Happy Dushera”.